In recent years, the testing options for antineuronal antibodies have grown in both quantity and complexity. Like every test system, the assays employed can produce both false-positive and false-negative findings. A number of measures, however, can minimize these drawbacks. Performed correctly, the detection of antineuronal antibodies facilitates differential diagnostics, enables a more accurate prognosis, defines the recommended therapy and informs the search for tumors. In this assay, cerebral tissue from rodents or primates is fixed, sliced into ultra-thin sections and then coated with dilutions of the patient’s serum and/or CSF. The binding of human antibodies is visualized by fluorescent labelling (not shown) or biotinylated antihuman antibodies and enzymatic labelling reactions. The brownish sections show where binding of human antibodies has taken place. This test cannot detect direct target antigens, rather it serves as a screen or confirmatory assay for the methods mentioned below. These test systems are used to transfect human tumor cell lines with the target antigen and label the antibody binding in the patient's serum or CSF with an anti-human, fluorescently labelled antibody. Afterwards, the evaluation is usually performed under a fluorescence microscope. Variants occur between fixed and unfixed cells. Cell-based test systems are used for conformational antigens, e.g. antigens that must be present in their natural environment and conformation (folding) in order to be detected by the antibody. Examples include most “synaptic antibodies” against NMDA receptor, AMPA receptor, GABA(B) receptor, LGI1-, CASPR2 etc. These systems test for binding to a recombinant antigen that has been fixed to membranes in “lines”. The Immunoblot or line blot method has proven its merits for confirming antibodies to intracellular antigens, e.g. Hu, Yo, CV2/CRMP5, amphiphysin antibodies. This method is only available in isolated scientific laboratories. It is designed to localize the target antigen on the surface of nerve cells in sera/CSF containing antineuronal antibodies in screening systems (1A) and whose target antigen cannot be identified with specific test systems (1B), meaning that an unknown target antigen might be involved. As explained in the text, exemplary visualization of tissue-based screening tests (A); cell-based tests as confirmatory assays are illustrated using a sample with AMPA receptor antibodies [(B) commercial AMPA receptor antibody (red), anti-human IgG antibody (green)]; immunoblot (line blot) as confirmatory assay for antibodies to intracellular antigens (C) and localizing the target antigen of unknown antibodies using neurons from hippocampal primary cultures. As long as certain particulars are considered, the autoantibody assay has very high diagnostic sensitivity and specificity for detecting the respective type of encephalitis. The numbers for NMDA receptor antibody encephalitis are: Specificity 100%, sensitivity 100% [98.5–100.0%]. These parameters are less well investigated for other encephalitis subtypes, but run empirically within a similar range. Not rarely, however, no detectable autoantibodies are found despite all efforts even though autoimmune encephalitides appear clinically likely (Graus et al, 2016). In clinically defined autoimmune encephalitides, the sensitivity of even a comprehensive antibody assay for all relevant neuronal antibodies is hence estimated to be 60-80%. (1) In individual subtypes, the investigations of the serum without concomitant CSF assay are clearly less sensitive and specific [e.g. in anti-NMDAR encephalitis 16% false-negative in pure serum diagnostics (Gresa-Arribas 2014)]. We therefore recommend that parallel antibody testing be performed on CSF and serum samples. (2) Standardized commercial test systems are available for targeted detection of the most common antibodies; they employ recombinant or purified, native single antigens. These assays are offered by many labs. 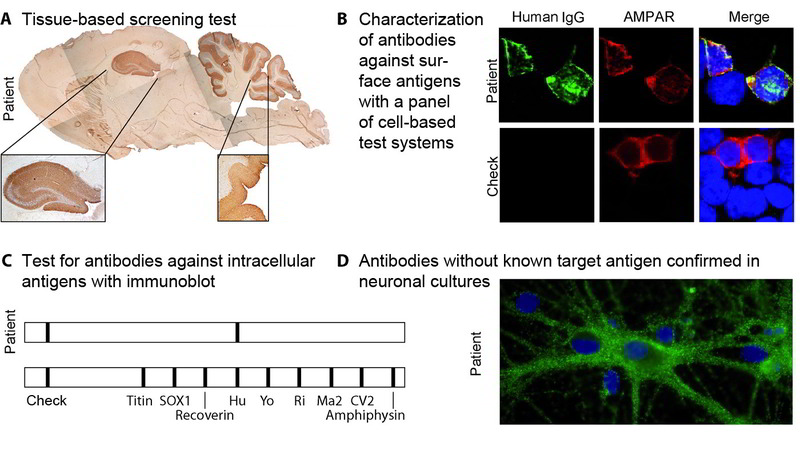 Given the overlap of symptoms between the different clinical pictures, diagnostics using autoantibody profiles (Figure 2) covering several known singular antigens and neuronal tissue can therefore offer advantages over a single-antibody assay. This test, however, ought to be employed in a targeted manner given its costs. *1 A particularly strong sign of encephalitis on magnetic resonance imaging (MRI) is bilateral edema of the mesial temporal lobe. Unspecific changes are most common, however, and MRI serves especially to exclude differential diagnoses. *2 Standardized, commercially available test kits (immunofluorescence tests with tissue and fixed, transfected cells, ELISA, immunoblotting). *3 Serum testing is sufficient for these antibodies. *4 Immunofluorescence results with commercial cell-based assays with low titers (< 1 : 40) but without corresponding CSF findings may be false positive. *5 For rarely occurring antibodies, individual decisions are necessary in the event of isolated serum positivity without corresponding CSF findings. AB, Antibodies; CSF, cerebrospinal fluid; GENERATE, German Network for Research on Autoimmune Encephalitis. (3) Isolated testing of serum for antibodies against neuronal surface antigens using these test systems (i.e. with transfected cells, also called cell-based test systems) can produce false-positive rates of 1 – 2%. Therefore, when antineuronal antibodies are demonstrated in the serum with low titers (< 1:40) in patients with encephalitis syndromes, they ought to be evaluated critically until the corresponding findings are found in the CSF and the constellation has been verified by more comprehensive diagnostics performed in a laboratory specialized in autoimmune encephalitides (Figure) (Graus, 2016). (4) Without exception, the autoantibodies verifiably associated with encephalitides presently belong to the immunoglobulin class G (Graus, 2016). The diagnostic value of antineuronal antibodies of the classes IgA and IgM is unclear. For example, IgA or IgM antibodies against NMDA receptors in the serum were demonstrated in up to 10% of patients with a variety of neuropsychiatric diseases and in healthy patients at the same frequency (Dahm 2014). (5) Under scientific test conditions, experiments have shown a correlation between disease activity and antibody titers in the CSF of patients with anti-NMDAR encephalitis (Gresa-Arribas 2014). However, this observation was not transferrable to routine diagnostics, indicating that antibody profiles over time are not relevant to clinical routine. In patients with LGI1 and anti-NMDAR encephalitis, the respective antibody has moreover been described to be persistent during the remission phase (Arino, 2016). (6) The currently available commercial test systems are able to detect the most common antineuronal antibodies. Nevertheless, there are no validated test systems available for many of the rarer target antigens. On top of that, new target antigens are constantly being discovered. In patients, clinically suspected of having autoimmune encephalitis, this diagnostic gap can be closed by special immunohistochemical methods, which usually are performed in scientifically specialized laboratories only. These investigations on prepared tissue sections, which are specific and gentle to the integrity of membrane proteins, represent additional screening systems for new antibodies while at the same time, enabling the testing and confirmation of already known antibodies. (Figure 1) (Dalmau 2011). Clinically suspected autoimmune encephalitis may therefore not be interpreted as seronegative until this tissue-based screening assay has yielded no evidence of any antineuronal antibody reactivity (Graus 2016). (7) 7. Not rarely, other systemic (e.g. ANA) or organ-specific (e.g. anti-TPO) autoantibodies can be additionally detected in patients with autoimmune encephalitides. Owing to a lack of knowledge about specific antineuronal antibodies and clinical pictures, such findings indicative of a general autoimmune diathesis can give rise to misdiagnoses (e.g. neuropsychiatric lupus erythematosus, Hashimoto encephalopathy). Hence, these diseases should not be considered in the differential diagnosis until comprehensive testing for antineuronal antibodies, including extensive serological screens, has been completed (Graus 2016). 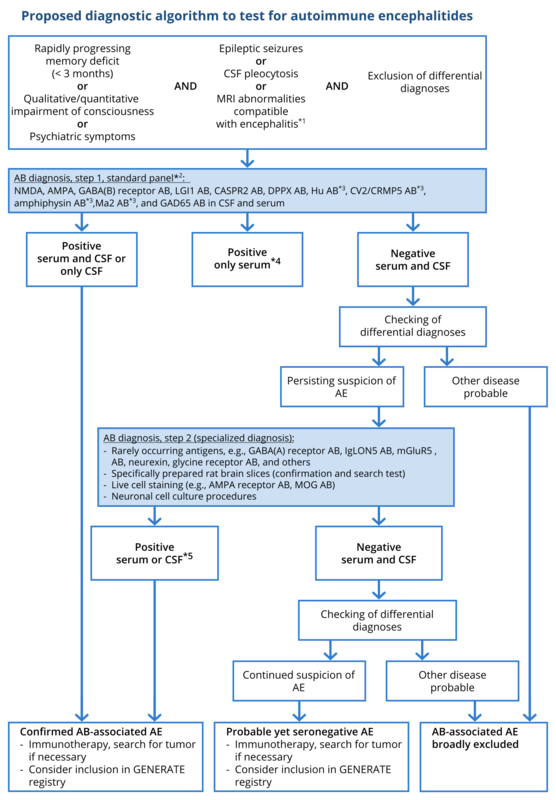 In summation, rational antibody diagnostics in patients with autoimmune encephalitides require (a) general knowledge of the clinical warning signs of underlying autoimmune encephalitis on the part of the attending physician, (b) an intra-hospital consensus or an antibody panel for standardized, syndrome-orientated antibody testing offered by a laboratory, (c) collaboration with a laboratory specialized in autoimmune encephalitides which offers suitable screening and confirmatory assays for the relevant antibodies, (d) close interaction between attending physician and laboratory when faced with atypical clinical particulars and positive antibody constellations or compelling clinical suspicion without any proof of antibodies. « How do we diagnose autoimmune encephalitides?